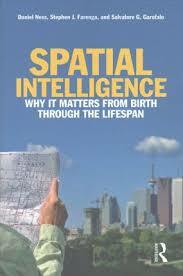 Here is a sample introduction for a research paper on spatial intelligence. One of the more famous applications of spatial intelligence occurred during the discovery of the DNA helix. Watson and Crick were able to take Rosalind Franklin’s flat molecular model and visualize it as the three dimensional double helix. Engineers apply spatial intelligence in the anticipation of the effect of various forces on a structure. Some scientists have claimed that spatial intelligence is an evolutionary development, grown out of an organisms need to navigate through its physical environment. Human beings adapted this level of spatial intelligence when they first started creating tools from rocks. Flaking, or breaking off flecks of sharpened stone, requires the ability to anticipate the sharper, new shape that emerges from the original rock. Spatial intelligence also allows human beings to order relationships and understand complex hierarchies as systems of organization. Spatial Reasoning research papers discuss one of the eight intelligences of Gardner’s Multiple Intelligence Theory. Howard Gardner and Educational Theory research papers are an analysis of multiple intelligences and their use in education theory. Learning Styles research papers discuss the different learning styles that efficiently and effectively help students to learn. Order a research paper on Learning Styles from Paper Masters. Paper Masters writes custom research papers on Spatial Intelligence and examine areas of Howard Gardner's theory of multiple intelligences.